Going to audience question events for the same author on consecutive days can have its minefields. There are going to be questions that come up both times because fans want to know the same things. 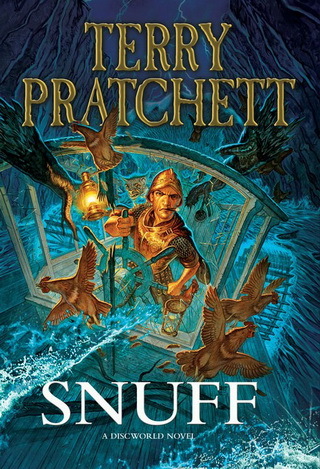 I’m sure Terry Pratchett has canned responses for whether he’s going to work with Gaiman again (probably not, but if they did a sequel it would be called “Jesus Christ!”) whether there will be another Aching book (probably not, and it wouldn’t be YA since she’s an adult now) or what his favorite character from Discworld is (Death, just like everyone else). I’ve not seen “the documentary,” which was filmed for the BBC and never aired in the United States. It’s called “Choosing to Die,” and follows Sir Terry as he interviews and takes part in the last few days of two mens’ lives who have chosen to die on their own terms rather than living with debilitating illnesses. The two DC stops were the last of the American leg of the Snuff promotion tour, he left from Capclave straight to the airport, and were apparently the first in which he was asked about the documentary. He and his assistant (who has perhaps the best job in the world, if a damnedably difficult one) shared their stories about getting to know Peter Smedley, a man both clearly were quite taken by as they explored his life, his decision, and his death. The documentary sounds brilliant for nearly every reason that will keep me from watching it. It’s not through any disagreement with the subject matter, but simply my dislike of contemplating the subject. Either looking at death in general, or being taken on a tour of death by an author who I admire so greatly but I know is suffering from early onset Alzheimer’s. A man who was only stamping books instead of signing them as his health just didn’t allow him to sit and scrawl his name in hundreds of books in a dozen cities. Because I know an unspoken, or perhaps spoken, theme of the documentary is Sir Terry deciding whether this will be the choice he makes, and when he will need to make it. Contemplating the mortality of one’s heroes is tough. It was spectacular to hear him talk about the documentary, make no mistake. He made the audience laugh even when describing the last few minutes of a man who quickly became his friend during the filming. If you’re a braver person than I, it sounds like a fascinating watch, if you can track it down in the United States. I know it’s available through some channels, but have not looked for it. I know that makes me weak in a way. So be it. I hate focusing on the maudlin part of Sir Terry’s two talks. I saw him for a total of about 150 minutes over two days, and the documentary discussion was only about fifteen of those minutes. Still, it stuck with me the most. The rest was the Sir Terry Pratchett I expected to see, but had never had the chance to see before. He and his assistant spoke of visiting Hobbittown (apparently you get a tour beyond that of most tourists when you’re an internationally famous fantasy writer), getting American book distributors to take Discworld seriously, and the few minutes they spent Occupying Wall Street the night before coming to DC. With the exception of being treated to the same excerpt from Snuff each day (no complaints, it’s a fantastic section, what?) the talks couldn’t have been more different. Perhaps each was better suited for the other venue, but the wonder of audience questions is that, while they can produce some cliched questions, they can also produce ones that catch both the speaker and audience off guard with spellbinding results. I’ll be talking more about Capclave this week, especially as Jen Brinn, con networking ninja that she is, has secured several promises of guest inspiration for this weekend’s Flashathon. I’ll be updating that page tonight and this week will push to get everything ready for the weekend. Update: Capclave panelist Scott Edelman has put video of the full Pratchett talk from Capclave on Youtube. It’s worth watching.